The farm Fleurbaix, which adjoins Libertas, was granted in 1694 to the Huguenot, Pierre Le Fèbre, who was employed by the Dutch East India Company as a surgeon. He had arrived at the Cape in 1683. He named the farm after his birthplace, Fleurbaix, a town in the Artois district near Lille in northern France. The name was Dutchified to Fleurbaai but has now returned to its original form. In 1800 the farm was owned by Paul Roux, who added the front gable and possibly built the outbuildings. The farmhouse is a freestanding H-shaped house with concavo-convex pediments. To the right of the house is a long wine cellar with concavo-convex end gables. To the left of the house is a long building that matches the wine cellar and was originally a planned longhouse. Adjoining the house is a fowl-run and there is also an early sheep kraal a distance behind the wine cellar. The outing will end at 12:00 and you will be able to picnic in the garden so bring your picnic baskets! If however you prefer to go to a restaurant for lunch, Stellenbosch town centre is close to hand. Our grateful thanks to Ivan Flint for offering to give the talk and lead the outing. PLEASE REMEMBER TO WEAR YOUR VASSA BADGES! OUTINGS ARE FOR PAID-UP MEMBERS OF VASSA ONLY! C. de Bosdari. 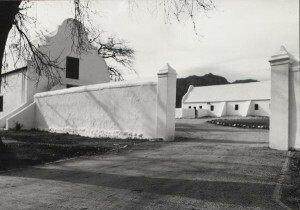 Cape Dutch Houses and Farms p74. James Walton (1989). Old Cape Farmsteads p39; 97 & 113. James Walton (1985), Cape Dovecots and Fowl-runs.pp84-87. Hans Fransen (2004). The Old Buildings of the Cape p233. Fransen & Cook (1965). The Old Houses of the Cape p103. As you all know, we as vernacs get to see inside homes not ordinarily open to the public. We have always refrained from making personal comments about decor or antiques, opening cupboard doors or entering rooms with closed doors, but it seems in the age of digital cameras, smartphones, facebook, twitter and other social media, we need to add another aspect to our etiquette. So, on future Vernac outings, please note that although we may sometimes be allowed to take interior photos if we have permission, we should use them only for personal or research purposes. It is suggested that details of interior architecture / fittings might be acceptable. However the property owner/occupant should be asked if they mind if any pics are put on the internet. Never post images of a farm online with either GPS co-ordinates or the name and location/address attached as caption or other “tag” (such as the “check in” option on facebook). We need to preserve the privacy of our hosts in this digital age! Of course, some already “public” exterior shots such as the gateposts or gables to illustrate your post to our VASSA facebook page after an outing are great.